Snared this little wonder just this week. I've not seen a Spirit comic as early as this. There's three stories within, all from the original newspaper strip (indeed each story and the cover boldly sports the title, "The Spirit Section") and none of the USA original comics, from the Quality in the '40s through to Harvey in the '60s sport this particular cover, which leads me to believe that it's an Australian original, cover wise. The only information I can gather on this one is that was published by Transport Publishing and I have no idea as to the date but I am thinking it might be around 1955-1956 due to the price, size and paper stock. Someone out there, like the ever knowledgeable Kevin Patrick, would probably know more about this than I ever will, so hopefully someone will share what they do know. Either way I'm damn happy to have it and will be looking for more examples of this run. 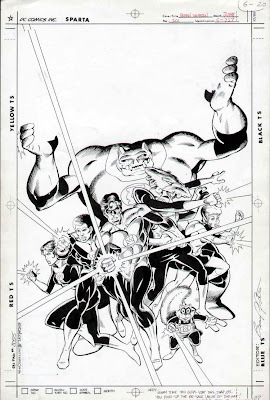 This cover was sold back in November of last year via the usual on-line auction outlets. There's nothing overly special about it, it's a decent enough cover and such items are always in demand with certain collectors. Personally I like my cover art to have logos and the like, but hey, you can't have everything. My only DC cover from the same time period, the cover to a Justice League annual also doesn't sport logos, but that doesn't mean it's not a great little piece of art. Having said that there's something special about this cover that makes it worth it's price. It's not the fact that it's a cover, or that it's Bruce Patterson, an artist I admire as an inker, but the writing in the lower right hand corner.